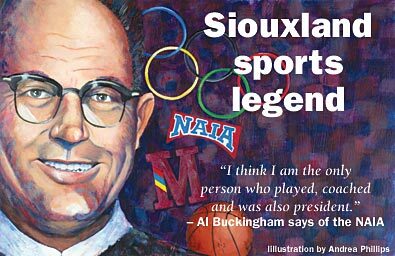 Coach Al Buckingham’s career spanned more than 60 years and included stints at Morningside College, with the NAIA and with the Olympics. Al Buckingham is a man who has worn many hats: athletic director, basketball coach, president of the National Association of Intercollegiate Athletics (NAIA), president of the Olympic’s World University Games, head of state planning — and the list goes on. For more than 60 years, the die-hard basketball enthusiast immersed himself in every aspect of the game, from competing in the first-ever National Association of Intercollegiate Basketball (NAIB) Championship in 1937 to later serving as the renamed NAIA’s president from 1965 to 1966. He dedicated more than half a century to his venerated alma mater — Morningside College. Throughout the course of his career he witnessed many changes, which ranged from blacks becoming part of the conference to a women’s half-court, six-on-six game that allowed no contact whatsoever. As he prepares for the basketball season this fall, Buckingham shares his thoughts and impressions on a game, and a life, that not only has been well lived, but loved. 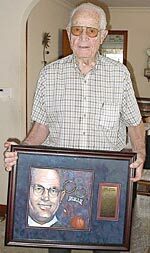 Al Buckingham, shown here in his Morningside, Iowa, home, displays the plaque Morningside College alumni and basketball players presented to him last year honoring his many years of service. It is two of many changes the coach has seen. The number of referees increased from one, to two, then three. There was a widening of the free-throw circle lane, the game no longer has jump ball and now they use midpoints. In addition to changes within the game itself, Buckingham also witnessed the breaking of racial barriers. From 1945-1947, Rosie Wilson — an African American from Sioux City’s Central High — played with the Morningside team. They’d gone down to Kansas City for the first of three annual tournaments. In a sense, Buckingham says, Morningside set the precedence to allow blacks into the conference. Though the NAIA didn’t allow black teams at first, Morningside’s insistence led to other colleges following suit, with the NAIA later crediting Morningside with breaking down the barrier. Buckingham discovered early on the key to a happy life. That attitude took him far, through a host of different countries, and not only earned him respect from the players but international recognition as well. For a boy who grew up in Westfield, just 20 miles northwest of Sioux City, the road was long and winding. As a Morningside college student, Buckingham and the Mustangs were back in the NAIB’s Championship title game for the second year in 1938. After playing in the game the first three years, Buckingham went on to spend the next 17 as the Mustang’s head coach. In 1948, he took over as Morningside’s athletic director and held that title until 1969. From 1965 to 1966, Buckingham also served as the NAIA’s president. “I think I am the only person who played, coached and was also president,” says Buckingham of the NAIA. During his time at Morningside, Buckingham also served as director of phys-ed and started their public relations department. Buckingham spent 20 years involved with the Olympics, the first 12 on the board where he started a housing job, then stayed in housing up through 1984. Those games came to be known as “World University Games,” in which Buckingham served as president during the 1960s. His role as “Chief d’ mission” — or “chief of the mission” — took him to Sophia, Bulgaria, as well as Asia, South America, Europe, Canada and Mexico City. Last year, Morningside alumni and their basketball players presented Buckingham with a plaque that honors his years of service. Missing from the event was Marian — Buckingham’s wife of 47 years — who died 3-1/2 years ago and whom he credits for making his life a success. “We have three children, and she did most of the raising because I was always traveling,” he says. I was fortunate to having lived next door to Al and Marian Buckingham during world war II he was stationed then at the jacksonville Naval Air station. Their oldest daughter was just an infant at that time. I was only 12 years old. The good ole days at Jax Beach Fla.